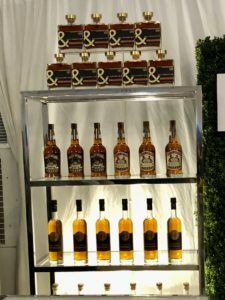 The 2108 Bourbon & Beyond Festival held at Champions Park, September 22nd and 23rd in Louisville, Kentucky featured a line-up like no other. Unfortunately the Sunday shows were canceled for safety issues due to severe rain and flooding. 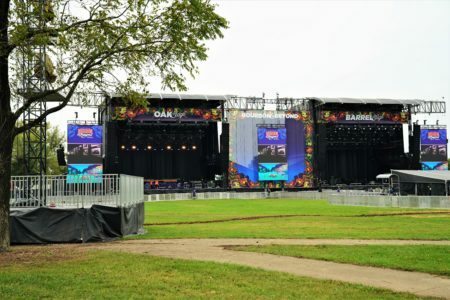 Festival goers still got to see great bands such as Lenny Kravitz, John Mayer, David Byrne, Sheryl Crow, Brian Setzer, Keb Mo, JJ Grey & Mofro, Joseph, Mindi Abair, Larkin Poe, Swimming with Bears, Reignwolf, Billy Strings, Phoebe Hunt, Lindsay Lou, and Michael Cleveland. It rained on and off all day which turned Champions Park into a total mud pit. The 25-30,000 festival attendees didn’t seem to mind. 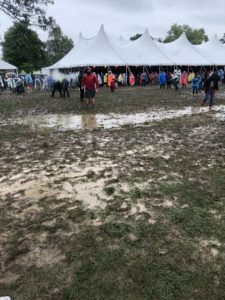 They stuck it out with their rain gear, muddy boots, wet clothes and hair to not miss any of the bands they came to see. Several fans ended up ditching their shoes all together and leaving the festival barefoot. You could look around and see several sandals that had been sacrificed to the mud gods. The bands themselves deserve an extra round of applause for their amazing professional performances considering the treacherous circumstances they had to endure. From getting rained on, their gear getting soaked, to even slipping and falling on stage. The set went on with all the smiles and enthusiasm as if the sun was shining. Several artists even smiled and laughed when their performance had to be paused for festival crew to try and wipe the water off of the stage. Bourbon & Beyond’s line-up offers such a variety of styles, with Blues, Rock, Pop, Folk, Country, Rockabilly, Soul, and Alternative that there is something for everyone. Swimming With Bears opened the day with their groovy pop style sound. They got everyone up and moving for the day with their upbeat sound and charismatic stage presence. Larkin Poe’s Soulful rock was a joy to watch and listen to. Rebecca Lovell’s powerful vocals and sister Megan’s unique style on the slide guitar made for a mesmerizing set. Reignwolf came on stage and took control with their grundge style rock and smoke and won the crowd over. Brian Setzer came out in the pouring rain and played his heart out. His upbeat Rockabilly style and stage show is never a let down. David Byrne was as mysterious and intriguing now as he was back in the day. His set was as different and unique as you could imagine. He opened up his set by serenading to a brain. Lenny Kravitz had to be the show of all shows for the night, for me at least. His music, voice, showmanship, and of course his look is nothing short of amazing. So many performers played their hearts out to wet and mud soaked fans that were in it to win it til the end for the love of music. Bourbon and Beyond gave them everything they could ask for and more. 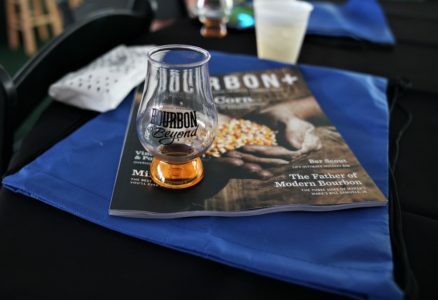 Bourbon & Beyond Festival is a celebration of music, food, spirits and let’s not forget great causes. 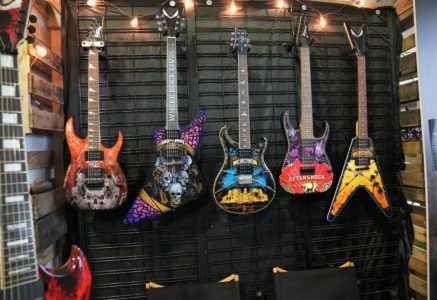 Ron Williams of Ronzworld Guitars is a very talented artist who hand-paints guitars to raffle off for charity at each of the roughly 16 festivals he does a year. The Rock Revival was given an opportunity to interview the artist and we jumped on it. 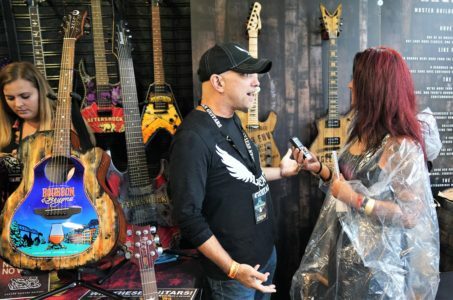 One of the first questions we asked Ron was how he got started painting guitars. He said “sheer boredom”. He used to be an illustrator in advertising, saw a guitar one day and thought he’d like to see how painting that would go. He took his work to NAMM (National Association of Music Merchants) in 2016 and was approached by a bearded man with green curly earrings named Squiggy, and the rest is history. The charity chosen for this year’s Bourbon & Beyond festival supports people with ALS. Jason Becker, who is an 80’s heavy metal rock guitarist came to Ron and asked him about supporting ALS. Jason had been diagnosed with the disease in the 1990’s and Ron was more than honored to be supporting a great cause to fight ALS, but also to be supporting someone he has idolized. Ron hand-paints (no stickers, no wraps) a limited number of guitars for the festival. They have the artists sign them, and then each night they raffle one off to a lucky fan who gets to take home a one of a kind hand-painted memory which also supports a great cause. I asked Ron which was his favorite festival. He stated he loves the Danny Wimmer productions as he himself is a fan of rock music. I also asked if he painted any famous musician’s guitars. He admitted to painting a few but wouldn’t divulge any names. He has also painted other items, such as motorcycle helmets and tanks but feels his heart is with painting guitars. He loves all the different styles which make for a cool canvas. He does not make any of the guitars, they are from the original manufacturers, he just turns them into one of a kind masterpieces. Be sure to check out his website www.itsronzworld.com and look for him at a festival near you. 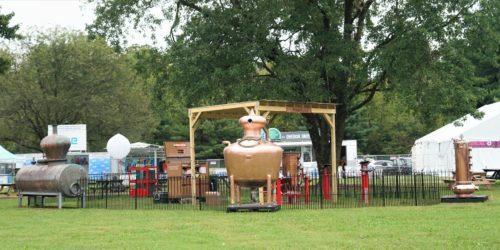 Bardstown Bourbon Co. has a “Collaborative Distilling Program” which features 22 different brands. Its an exclusive and completely custom program. From start to finish, all the partners get to produce, warehouse and showcase their product with Bardstown Bourbon Co’s facility. Bardstown Bourbon Co. is also the only distillery on the Kentucky Bourbon Trail to offer a restaurant. Which features a full service restaurant, bar, and vintage whiskey library. CEO, David Mandell feels it offers another level to the Bourbon Experience he is working to create. He also feels it is the foundation for the innovation taking place with their culinary team working side by side with the distilling team to create flavor combinations an finishes for a better visitor experience as a whole. With Master Distiller Steve Nally, who is a hall of fame Master distiller, teamed with Executive Director of Distillery Operations, John Hargrove, Bardstown Bourbon Co has over 15 years’ experience in making whiskey and Bourbon. With all that behind them, there is no doubt your Bourbon Experience will be most memorable. If you missed them at Bourbon & Beyond be sure to get yourself to Bardstown, Kentucky and check out their Bottle & Bond Kitchen and Bar restaurant and be sure to get yourself some bottles from their Collaborative Series. For more information, visit their website at www.bardstownbourbon.com. Tagged Billy Strings, Bourbon & Beyond, Brian Setzer, Danny Wimmer Presents, David Byrne, JJ Grey & Mofro, John Mayer, Joseph, Keb Mo, kentucky, Larkin Poe, lenny kravitz, Lindsay Lou, Louisville, Michael Cleveland, Mindi Abair, Phoebe Hunt, reignwolf, sheryl crow, Swimming with Bears.